Happy Monday, folks! If you know me, you'll know that I am no good before coffee and since Monday's are designated 'drink too much coffee' days, I thought writing a very long awaited London coffee post was the way to kick this day off! I am in London for a few days visiting different graphic design and advertising studios with the university, alongside this I hope to drink my way through the city's best beans. 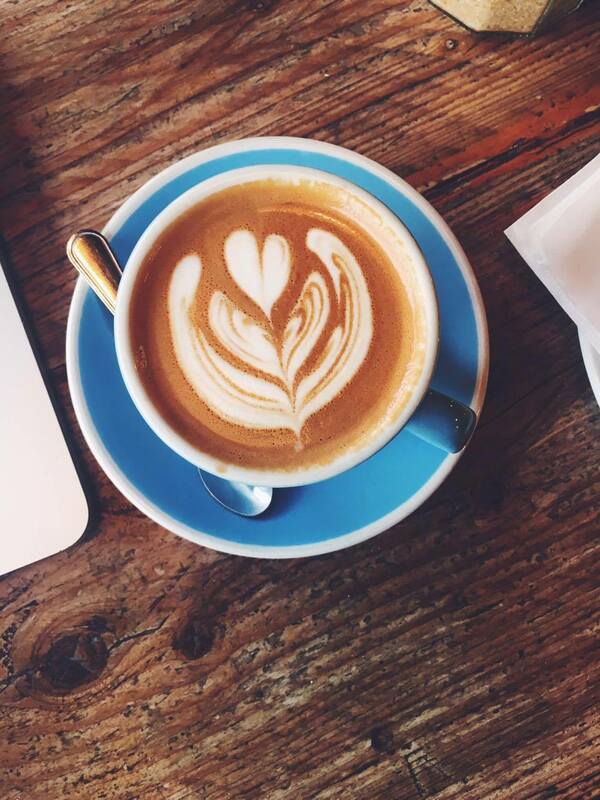 I've often come to London and made coffee a priority, because you know, coffee? So now that I've sipped enough Long Blacks and Flat Whites, I feel somewhat qualified to share some of my favourites. I am currently sitting at Cable co. after a great recommendation from a friend of mine. 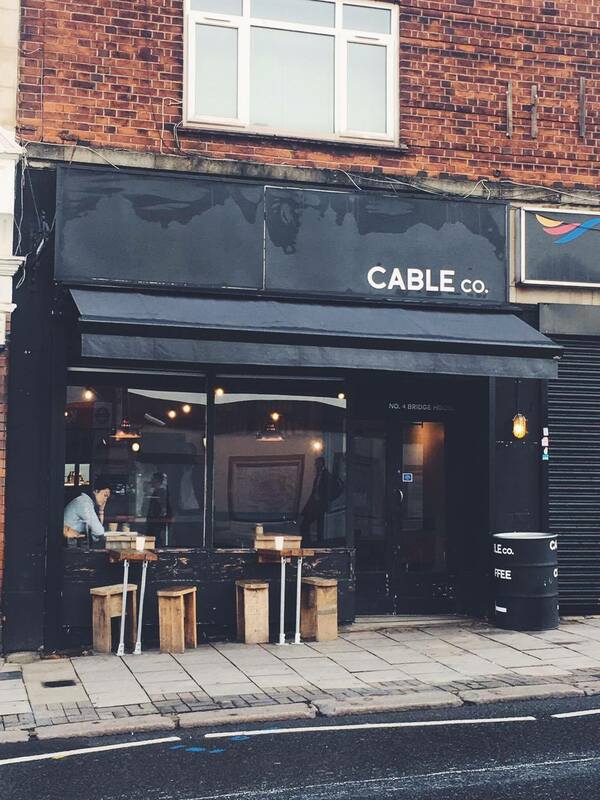 Cable co. is the definition of "café culture". The atmosphere created by wooden table-benches, some industrial steel and lightbulbs hanging from the ceiling, friendly staff and the most legendary St Bernard dog sat in the corner. Some intentional greenery in the corner and a cake cabinet full of yummy treats. "I'll have a Flat White and a croissant please"
"There's a 20p charge if you're paying by card" - 20p, for London, fantastic - but note to anyone else visiting, bring cash. Perfectly stretched milk, the right sized cup and a smooth shot of espresso mixed in to form idyllic latté art and make for the most delicious flatty to start the day. I first visited Brooklyn Coffee in the summer of 2014 while roaming around the city with my mom so it was with delight when my friend suggested a great coffee spot around the corner for Spitalfields Market. The coffee was great in 2014, and two years later it was equally fabulous. Smaller than most coffee shops, the intention would be takeaway caffeine, but if you're in to people watching, the window bar seats are perfect! South Kensington is full of coffee shops and community attractive spaces. Brompton Food Market is all things food orientated. The fresh display of fruit and veg that greet you as you walk in make this spot a feel good fuel stop for sure! Brompton Food Market pride themselves on being a butcher, greengrocer, fishmonger and deli all under one roof. If you head straight through the shop and walk out the back door you'll find yourself in luck as they have incredible outdoor seating, all undercover and heaters to make this completely winter proof! Their coffee wasn't the hipster speciality kind, but absolutely delicious and would only improve your lunch or brunch! With it's slight country-in-the-big-city feel, a must visit if you're in the area! For today, that is it. I'm off to play 'local' and make this big city my own for the day. I hope you all have an absolute cracker Monday, and of course, may you never lose your wander!